Joel Seah is a wedding photographer based in Singapore who specialises in the role of a second photographer. His photojournalist style complements the first photographer perfectly, allowing couples to enjoy a wider range of photos that showcase both traditional portraiture and candid wedding photojournalism. 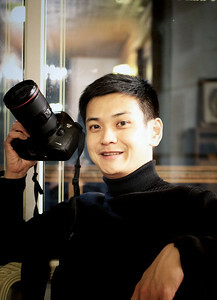 He is also a co-founder of JS Wedding Photography, a wedding photography service. While there will always be a demand for the more mainstream photos that are usually posed for the camera, Joel believes that photos of the little details that go unnoticed during the day, along with fleeting and natural moments that the couple share, will provide a different type of joy. These are the photos that bring back lovely memories of beautiful moments and put a smile on the faces of the couple. They will trigger laughter as the couple look back on the events of their big day and ultimately, enhance the memories of that once in a lifetime event. Joel's photography style also makes use of available light as much as possible, which means that the flash is seldom used unless necessary. This helps the first photographer as there will be less "unplanned" light, and allows the couple and guests to be more natural without the surprise of sudden lights in their faces. Acceptance into the Artistic Guild of the Wedding Photojournalist Association (AG|WPJA) also serves as an affirmation of his photography style by fellow peers, particularly his emphasis on having a more photojournalism approach. Engaging a second photographer is slowly becoming more popular among wedding couples as more people start appreciating a wider variety of photos; having a collection of artistic and candid moment shots in addition to the usual genre of photographs seen in everyone's photo albums. That said, photography appeal could be rather subjective at times, so awards and affiliations will count for nothing if the couple do not find the photographer's style to their liking. Take a moment to browse through the photos in Joel's gallery. If you enjoy his photos, simply drop a note through the Contact page to discuss how he can play a role in creating your very own timeless wedding memories!